1. Filling: Place all filling ingredients into a mixing bowl and mix together until completely combined. Season with salt and pepper, cover and refrigerate until ready to use. 2. Laced pasta dough: Lightly flour a clean surface, roll pasta dough into a paper thin sheet, 24” by 24” in size, and cut it into 6, 4” wide strips. Top one third of the strips with two rows of herb flowers and leaves and top each with another sheet of pasta. 3. Roll sheets together until paper thin and herbs have been encased in the dough. Gently toss the pasta with semolina and cover with plastic wrap until ready to use. 4. To assemble : Spread out pasta sheets onto a clean surface and brush away any excess semolina. Place tablespoon-size dollops of filling every 2 inches along the length of the pasta sheets that aren’t covered in herbs., making 12 mounds per strip (24 total). 5. Brush the egg wash all over the pasta surrounding each mound. 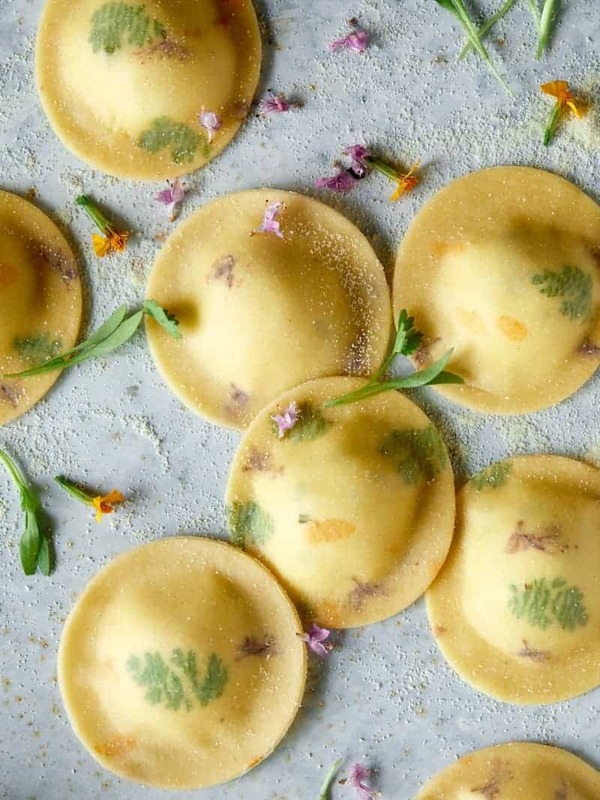 Carefully lay a second sheet of pasta over the top and gently press around each mound of filling to release any air bubbles and seal the ravioli. Use a 2 1/2 inch round cutter centered around the mound of filling to cut out the 12 ravioli, per strip. 6. Bring a generous amount of salted water to a boil in a large stockpot. Carefully add half of the ravioli and boil for 3 minutes, just enough to cook them through. 7. While Ravioli cooks, place large skillet over medium heat and add half butter. Melt and toast butter until lightly browned and it beings to have a nutty fragrance. 8. Using a slotted spoon, transfer ravioli from boiling water to the skillet with browned butter. Lightly season wit salt and pepper. 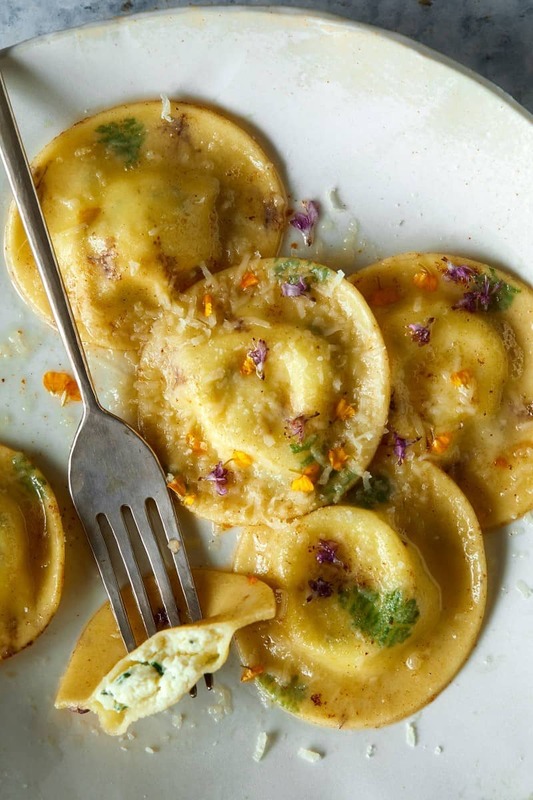 Transfer ravioli to a platter and top with herb flowers and grated Parmesan. Finish with sea salt. 9. Repeat steps 6 through 8 with remaining ravioli and butter and serve. Food art worthy and delicious, thanks for the spring inspiration! I can only see semolina flour for sprinkling on the ingredients list. What volumes and type of flour do you use for your pasta dough?